I like “one word” explorations to sum up an experience. 2. the set of circumstances or facts that surround a particular event,situation, etc. An important concept to know is that in the context of any English teacher conference, authors are rock-star-like celebrities that drive well-manner educators at every grade level to act like paparazzi at gala openings; it’s literary fandom gone wild. Staid teachers will suddenly go stalker-mode, staging selfies and pressing writers for autographs. When they do catch (trap?) an author, these articulate adults -who are capable of controlling legions of adolescents- will suddenly go tongue-tied, lining up to blurt out Hallmark-like sentiments: “love you” “you’re the best” or “you changed my life”…drowning the poor author in a litany heartfelt sentimentalities. At these conferences, authors should know to be careful not to incite such emotional responses. 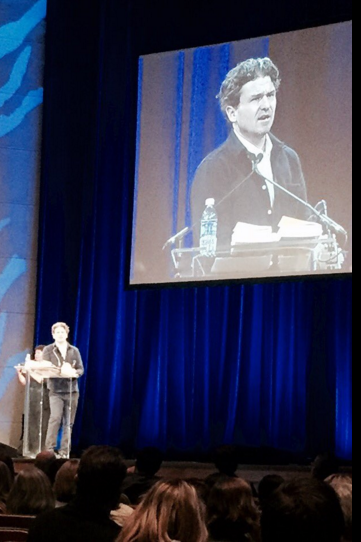 Which makes me wonder how the author Dave Eggers made it out of the Minnesota Conference Center Auditorium in one piece! Eggers was the Saturday night speaker (11/21) where he delivered a heartbreaking speech of humor and pathos dedicated to teachers…and to one teacher in particular. He is the author of ten books including Zeitoun, The Circle and A Hologram for the King, a finalist for the 2012 National Book Award. He is also the founder of McSweeney’s, an independent publishing company that also publishes Voice of Witness, a nonprofit book series that uses oral history to illuminate human rights crises around the world. He began by asking the all-educator-audience to picture a 14 year-old boy “covered in zits” with “foot odor”, a friendless outsider, “angry” and unhappy at home. Many teachers did not have to imagine such a 14-year-old; this brand of boy is often seated in their classrooms. Eggers proceeded to explain how this boy’s anger led to a subversive approach in responding to English writing assignments: the argumentative paper he wrote promoted a bike trip to the inner mantle of the Earth; the informational essay he wrote warned of the coming sheep apocalypse. When the anticipated confrontation to change topics did not come from his English teacher, the boy channeled energy into the papers….and he became less angry. Both assignments received an A-. Eggers detailed how such encouragement from his teacher brought the boy to the school’s newspaper, then to the school’s literary magazine, and then to the attention of the “elders in the tribe” of the English Department. All heads nodded in agreement; they understood the “he is me” context. Gasps….and hundreds of misty-eyed teachers stood in applause as the teacher, Mr. Peter Ferry, rose from the front row to take a bow. Eggers rushed down to him and handed over a box festooned with a bright red ribbon. More gasps and more applause. Gasping air depleted, teachers could only clap harder in appreciation for such inspiration, and as cliché it sounds, there were teachers shouting their (intellectual) love for Eggers. But for the height of the stage, he could have been mobbed. He held off the crowd by answering questions, and this gracious opportunity provided another familiar educational context…the Q & A interview. As Eggers is also involved in his own educational enterprise in supporting writing centers, he shared pictures of 826 Valencia the first of eight tutoring centers for schoolchildren, 6-18. His efforts began in San Francisco in 2002 with the plan “to close the academic achievement gap for under-served youth in the Bay Area by connecting caring adults to young people in need of individualized support.” In describing the activities at this writing center, he explained that the original space was zoned for retail, and that they needed to open a store. The ship-like surfaces of the former gym gave them the idea to open a pirate store, where the pirate supplies profits helped offset the rent to the writing center. In sharing the stories of Mr. Ferry, 826 Valencia, and 826 National with English teachers, Dave Eggers served as an illustration of the the word context. The etymology of the word context comes from the 15th C. Latin contextus meaning “a joining together”. The word context was originally the past participle of contexere, which means to “to weave together,” from com- “together” + texere “to weave, to make”.